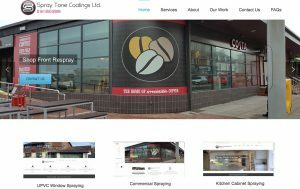 Spray Tone Coatings specialises in all forms of spraying for both the commercial and domestic market. 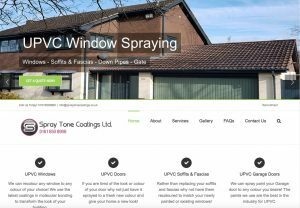 Please visit our site if you are interested in upvc window and door spraying. Spray Tone Coatings offers a wide variety of on site spraying to the commercial industry. This includes corrosion works, cladding repairs, shop front spraying, suspended ceiling spraying and roller shutters. 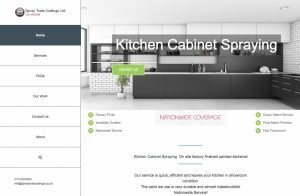 Spray Tone Coatings offers an amazing factory finish spray job for kitchen cabinets. This is an onsite service with no need for having to send your cabinet doors away for days on end. Ian and Steve did a stella job in bringing what was quite a massive job in on schedule and to an amazing finish, their attention to detail and passion for the project surpassed expectations. Bringing this heritage building back to life and looking as it would have done back in 1916! I’ve been using Spray Tone Coatings for a number of years on all of my projects. They get the job done, on time and to a fantastic standard. Need I say more. Depending on the size of the job it will take us between 1 or 2 days to email you a detailed estimate, which you can then accept or decline online. Once the quote is accepted depending on the size of the project we will arrange a site visit. This is to ensure that we have covered everything. When we have collated all the information we require we will then compile a method statement along with risk assessments and email these. The final stage is delivery and making sure we bring the project in prior to the practical completion date.